Your annual commencement speaker outrage reminder memo: purity trolls and free speech trolls alike stand down! Students who write op-eds for campus newspapers (or any newspapers) aren’t “silencing” anyone. They’re exercising their right to free speech. Faculty who sign letters of protest and/or promise to boycott graduation because they dislike the speaker are not “silencing” anyone. They’re exercising their liberty of speech and association. Repeat until no longer outraged! I can’t help but notice that an unusual number–considering the actually atrociously small numbers of women CEOs, heads of state, and in the diplomatic corps–of these protested campus speakers are women: Christine Lagarde at Smith, Condoleeza Rice at Rutgers, and now Albright at Scripps. Some students and faculty seem to have expectations that women in public service–as opposed to men in public service–to be more morally pure than their male peers and pass some impossible leftist purity test too. Are you really surprised that colleges and universities choose commencement speakers who took leadership roles and achieved something, as opposed to the legions of morally pure beautiful losers? DUH! Maybe they should look to the nineteenth century to find commencement speakers of sufficient virtue and without any involvement in politics or world affairs? 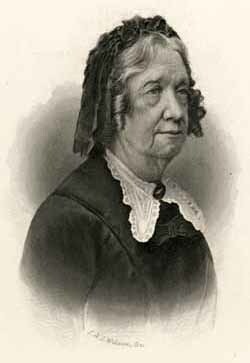 I hear that no one has invited Catharine Beecher to speak this year, but that’s only because she’s been dead since 1878. ← Restroom panic! The solution is so obvious. I am so jealous! We had some random producer. 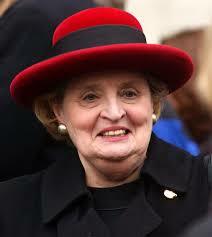 How is Scripps even able to get Madeline Albright? The LA Times points out that it’s quite a coup, because Scripps doesn’t have the dough to pay a big speaker’s fee. I think that Albright, like a lot of successful women, is probably willing to talk to women’s colleges just because she believes in the refreshing feminist idea that young women should be encouraged to dream big and work hard, and also in “lifting while we climb,” to borrow a womanist idea. In the spring of Four Dead in O-hi-O, we had some boring conservative Republican junior senator from Ohio, who said all the right patronizing things about the well-meaning but inexperienced longhairs sitting in front of him who would eventually become useful citizens. I think we were too frazzed-out to protest anything by that time, beyond the ill-considered decision to move the operation inside with the passing threat of a shower. I would have loved it if Angela Davis had zip-wired down from the top of the pipe organ to denounce us as a bunch of honkie liberals who should have shut the whole thing down, rather than smugly wearing arm bands and peace symbols on the mortar boards. Instead, just a bunch of junior staff-written drone about…. I forget. On Monday, Penn is having Lin-Manuel Miranda, who instead of giving an earnest inspiring speech, I would hope would wave the whole cast onstage for a couple of production numbers. Then the graduates’ grandchildren would be forever asking “…. but how did you get TICKETS?!? !,” to which the obvious answer would be: practice, practice, practice. HAhaha! That’s cool Penn got L-MM. Hit broadway shows are intergenerational crowd-pleasers! Both Trump and Biden were at Penn this evening, as parent and grand-parent, respectively, of graduates, for the Arts and Sciences commencement ceremony, but neither are expected at the big U-wide event tomorrow. No tickets required for the latter, but graduates reportedly have to be in “regalia” to “walk,” and–unlike in my day–decorating, annotating, or otherwise modifying the latter with extraneous messaging materials is decidedly not encouraged by the authorities. The enforcement of such dicta is why universities still have oddly-named offices for ancien regime functionaries such as marshals, plenipotentiaries, and custos-rotulora, to name only a few. You don’t want to meet the guy with the mace. Hear hear! Albright was a (paid) speaker on my campus some years ago, and was terrific and gracious. I agree with you about the purity — we talk about empowering women, but power by definition is not pure, and of course government officials have to make compromises all the time. Feminists in particular have had trouble with actual women exercising political power, so we see the double standard of “you go, girl” combined with outrage at the morally imperfect results. Man, Scrippsies. What can you do? So is Scripps not teaching this stuff, or are certain majors not teaching it, or are some kids just not understanding ambiguity? Like, that’s one of the main points of college. And I know it’s taught well to all the kids we get as graduates from regional midwestern undergrad schools and not at all well from the kids we get from Southern flagships. But we don’t get a whole lot of kids who majored in something other than a small handful of subjects that are more likely to have to deal with difficult questions without truly right answers. We had an alumna as our commencement speaker earlier today and she was super, mixing her own intellectual pathway with some of the expected lessons about life. Our event always features live music and we had an a cappella sextet, who sang remarkably family-friendly, compared to what I think they are most well known for singing. Live music is a really good addition to all the yapping. I give one of these genre speeches every year, just to the graduates of our School. I made my most substantively bilingual remarks yet this year, and talked about living and working in the midst of things. No matter what the headline speakers tell you about closing one chapter and opening another, the fact of the matters is the only place you actually are is here and the only time you have control of is now. And most of the time, that’s where your community needs to you be–out there in the thick of it. Hey, congrats on your bilingual commencement address! And great point about the power of live music. I’d rather see honoraria go to pay musicians than the already rich and famous. Well said Historiann. I don’t think I agree with Madeline Albright on some political issues, but I think she is one hell of an interesting person and well worth listening too. The same thing goes with Christine Legarde. For the record, I believe Condelezza Rice technically would meet the conditions for being charged as a War Criminal, especially under the terms set by the Nuremberg Trials after World War Two or the Yugoslav Tribunal, as would every US President since Harry Truman. But again, here is someone with an interesting career and who probably has some things to say about life and education (she was also Provost at Standford, for crying outloud! ), so lets lighten up. Its a little tedious to have the rich and powerful piss and moan about being ‘silenced’ when they have access to the 24/7 media frenzy that is cable news and online newspapers. The NYTimes practically exists to give the Albrights, Legards, Rices, Kerrys and Giulianis of this world a platform from which to pontificate on a weekly basis. These cannot be the only examples of speakers being threatened with boycott or protest. Why do you suppose the incidents at women’s’ colleges feature so prominently in the news over the last few years.? I don’t know, except that maybe it’s even easier to patronize college students when they’re all women? To be fair, the Rutgers and Haverford stories were big in 2014. I haven’t heard of any other commencement speaker protests/accusations of college students being intolerant of free speech this year yet. But it’s only May–there are all of those graduations in June ahead of us! Our speaker today was a (very nice) male government apparatchik, who was, I gather, friends with the head of development, a first gen student when in college, and a hispanic leading a federal agency. As these things go, he was fine — he told stories, but it was mostly: don’t try to write the script, and when things happen, sometimes you just jump and do it. Compared to some others I’ve heard (the insufferable CEO of a hospital chain that holds a monopoly in our town) he was refreshingly unassuming and unpretentious, as well as sane. Part of me thinks we shouldn’t bother with commencement speakers, because really, no one cares. As for the kerfuffles, I want to think about the fact that they happen at elite institutions, (mostly) in a way that is not snarky about the students there. FWIW, I think one of the things about maturing is the ability to tolerate ambiguity and shades of grey. I hope it happens in college, but not everyone is there by the time they graduate. Some of my colleagues are still all about purity. Well, there are moments when we all insist on purity for various reasons. I would have signed the petition against Rice receiving the outrageous speaking fees AND the honorary degree, but never against her speech. If the circulation of ideas is so effing important, let her speak, but let her speak for a nominal honorarium and travel expenses. After all, Rutgers is a public university, and Rice was a public servant! Yes! Amen to this! I would have to say that let Harvard and Smith spend what they want on speakers, they have the endowment for that kind of thing, but its a breach of the public trust for a public university to offer anyone, regardless of their politics, obscene speakers fees. Wrt Rice, when she came to our public U , one of my students had the fundraising job to pay her fee (as part of her campus job). A lot of, I know you already gave this year, but extraordinary opportunities cost more. So she was targeted donating and not from general revenue. One thing I don’t understand, and maybe I don’t know enough about it, but how are Secretaries of State like Albright and Clinton getting the exclusive blame for policies carried out under their respective presidents? I hear people all the time saying that Clinton is “more hawkish” than Obama, but does that mean Clinton was independently doing things Obama had no knowledge of and didn’t approve? If Clinton is a hawk, why isn’t Obama a hawk? If Albright is a war criminal, why isn’t Bill Clinton a war criminal? Thank you! I have been saying that for months! It particularly galls me in Clinton’s case, because if she hadn’t carried out Obama’s policy, the same people would have accused her of undermining the First Black President, in revenge for his beating her out for the nomination. Not that you don’t hear them accuse her of being consumed with resentment anyway. And of being a Secret Rightist. Heck. two days ago I saw self-identified Sanders supporters on YouTube rag on Clinton for being a Goldwater girl — in 19-effin-64, for cripes sake! There are people on the left who consider Bill Clinton a war criminal. But most of those I’ve read assign the essential blame for it to Hillary Clinton, as they do most if not all things they disliked about Bill Clinton’s policies — even when it was clear from the media at the time that those in Bill Clinton’s cabinet promoting those ideas (Larry Summers, anyone?) resented and opposed Hillary Clinton’s input and influence. I have never met Hillary Clinton, but one of the attorneys I used to do a lot of work for, whose opinion I trust, attended a conference in late 2007 or early 2008 that Hillary spoke at, and had the chance to talk with her afterward. Jill said that she was clearly brilliant, as well as gracious and charming, in her speech and their short exchange. That led me to re-examine my own assumptions. I hadn’t been anti-Clinton before, just not particularly enthused, but learning more about her turned me into a supporter. Sorry if I was off-topic with the last paragraph, but since the subject was women speakers, I hoped it would fit. In my line of work I meet and listen to a lot of people who have worked with or for Clinton and they say she is a great boss, cares a lot, hardworking, competent, a great bureaucrat etc. Who is blaming Hillary for being hawkish based on only her tenure as Secretary of State? (Pause to hear Crickets chirping and watch tumbleweeds rolling by.) Is there a serious case to be made that Hillary NOT more hawkish than Obama? If so, I’d like to hear it. But it’s not as if Hillary emerged unmolded, and only by being appointed SecState did she develop foreign policy thoughts. We are familiar with the Iraq War vote, yes? Hawkish doesn’t even always have to be bad. I sure wish Bill Clinton had been a bit more hawkish with regard to Rwanda, for example. And I’m sorry, but what serious analysts of foreign policy blame HILLARY for Bill’s foreign policy? I’m going to need some citations. I’m all-in on Hillary, am buckling in for what will be some ugly misogynist campaigning, but in point of fact Hillary simply IS more hawkish than Obama based on any serious understanding of recent American foreign policy. Hell, it’s this sense of “toughness” (as opposed to Obama’s alleged “wimpiness”) that I am looking forward to seeing unleashed against Trump. Well, here’s just one example of many articles that have been printed blaming Hillary Clinton, and only her, for intervention in Libya. http://www.huffingtonpost.com/david-bromwich/hillary-clintons-libya_b_8590130.html. Though I heard an interview with Obama on the radio the other day in which he detailed what he felt were his own shortcomings in dealing with Libya. He seems to think he was president during that time and making the crucial decisions on how to approach that situation, who knew? So you can stop listening to crickets. Also, one vote for war in Iraq doesn’t prove irredeemably that Clinton is “more hawkish,” but when people point to evidence, that seems to be the only piece they can bring out. Obama has been deploying drone warfare for years now. Samantha Power famously called Hillary Clinton “a monster!” She appeared to resent Clinton because of Bill Clinton’s failure (in her view) to intervene in the Rwanda genocide in the 1990s. But your point is a good one–the only people who want to give Clinton all of the blame (but none of the credit) for the Bill Clinton administration are partisans, not serious analysts. In 2008, the Obama campaign made these arguments against Clinton in the primary, and this year it’s mostly the Bernie Bros.
Samantha Powers is a world class jerk. Meanwhile, nothing on the alleged myriads of serious analysts blaming Hillary for Bill’s foreign policy. And a Huffington Post article blaming Hillary and only Hillary for Libya. I see we’ve chosen to hang our arguments on the thinnest reeds we can find, apparently to test their tensile strength. The crickets continue to chirp. The tumbleweeds continue to tumble. I would have thought, quaintly, that when people brouight up foreign policy experts that they could then quote the experts they are invoking. Silly me. Instead we get a single crap HuffPo article. Yes, Obama has angaged in drone warfare that there is no serious evidence that Hillary would not also do. But on the whole, again, is it REALLY all that crazy to call Hillary more hawkish than Obama? And does that have to be all that damning a criticism? And are we really saying that major votes don’t count for much in assessing a politician? “Breaking News at 11: Politician’s record in assessing their politics not to be found in their politics.” That’s … interesting. Perhaps you can bring out your footnoted thesis on all the ways Hillary is more hawkish than Obama, since you’re so dissatisfied with the quality of discussion here. Or you can continue to point to one vote, which she’s since repudiated. I’m not sure what’s at stake here; this is a post about whiners and crybabies about commencement speakers, not about which Democrat is more hawkish. I think these women have calculated–probably correctly–that it’s safer to avoid dove-ishness and to let people in the U.S. and abroad wonder just how far they’ll go. Like nicoleandmaggie above, I wonder what lessons about women, gender, and political power are being taught and learned at places like Scripps and Smith that have revolted against speakers like Albright and Lagarde. It seems as though the protesting students have a fantastic (vs. a realistic) view about how women have embodied and used power in the past, and how that shapes how they might do so in the present & immediate future. I will gladly compare our writing on American foreign policy if you want to make this personal, Linden. That one repudiated vote matters. But more to the point, for me it’s not even necessarily a critique. It is simply a fact that in the wide range of big tent foreign policy views, which historically do not always overlap with ideology, and where ideology and partisanship have historically ended at the ocean shore, as the cliche goes, the Democratic Party (and the Republicans for that matter) have been widely inclusive. Hillary is more hawkish than Obama. She is more hawkish than Sanders. I trust her far more than Sanders on foreign and military policy. I trust her as much as Obama. I’m living abroad and have spent large hunks of the last two decades abroad. I’ve seen the effects of America’s reputation in the world under Bush and I’ve seen the way it has imporved under Obama, and I like the latter more than the former when I am travelling, working, or living outside of the US. Like Historiann says, there is surely a gendered component to all of this as well, but also a party/ideology aspect — many leading Democrats became more hawkish to counteract the whole narrative of Democrats as weak on foreign policy. Post 9-11 it was a fraught landscape, and Hillary was operating within that landscape. Hillary is more hawkish on Israel as well. She was the more hawkish voice on Libya. I’m not certain how many examples you want, and I’m not sure why it even matters all that much. But it is perplexing to deny it. I thought those of us on the left were the ones who subscribed to an empirical and reality-based view of the world.